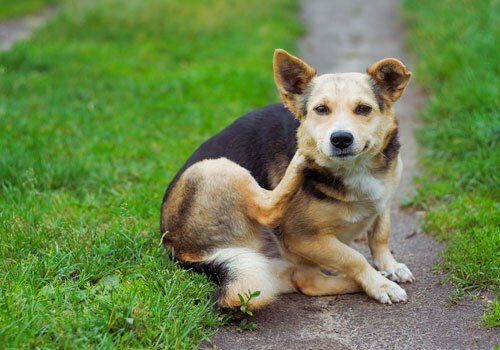 Pet owners would know how irritating and harmful fleas can be. Thus, it is important to find the best flea shampoo for dogs to control the situation and keep them at bay. Fortunately, there are various products in the market today that are efficient in killing these pesky creatures. This wide array of products can be overwhelming, especially for the first time buyers. You can choose from natural methods such as using a flea comb, products with natural ingredients, highly medicated solutions, prescription treatments and other options that claim to be effective in controlling flea infestations. The most popular among these are the spot-on treatments that are easy to apply and can be purchased in various retailer stores, online stores and pet shops. One of these is flea and tick shampoo for dogs. 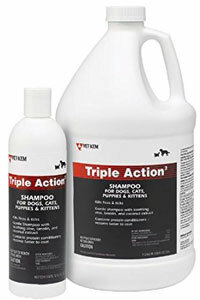 These shampoos are specially formulated to kill fleas in all stages of its life. 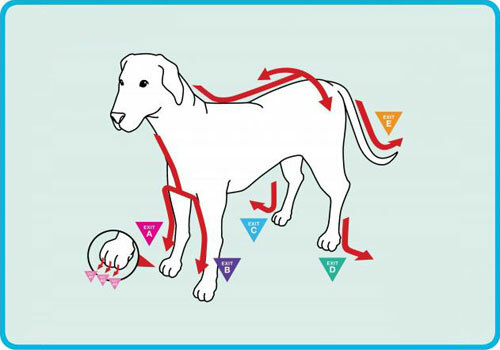 Using dog shampoos is the best place to start your dog’s flea treatment. Note: Above ratings are based on our experience with the product and/or expert opinions. Click the link above to read best flea shampoo for dogs reviews 2016 and see the current prices on Amazon. What’s Inside a Best Dog Flea Shampoo? 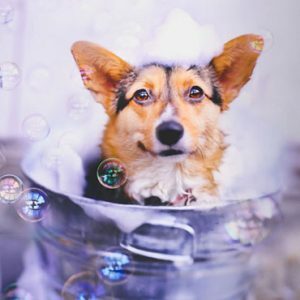 Before you use any of these flea shampoos on Fido, it is important to read and understand the labels and the risks and benefits of every ingredient. It is also important to ask the vet first to avoid irritation and skin allergies. Let’s see what a good flea shampoo for puppies & dogs actually made of. Below are some of the most common ingredients used in puppy flea shampoos. Pyrethrins are natural extracts that have been used as an ingredient in flea products for many years. It can also kill lice, mosquitoes, ticks, and mites. The extracts are derived from the flower of Chrysanthemum plants which are abundant in Europe, Kenya, the Middles East and Japan. It works by interrupting the natural flow of sodium from the nerve cells of the parasites. This will cause affect the nerves, causing it to fire off, which will eventually kill fleas. Pyrethrins are commonly used in topical treatments. The substance can be broken down by stomach acids and is highly hydrolyzed thus, it is very rare to cause toxicity to dogs when ingested. Although rare, toxicity does occur. There are six types of pyrethrin called pyrethrin I and II, jasmolin I and II and cinevin I and II and all of these types can be found in flea products like flea shampoo. Pyrethroids are synthetic compounds which also attack the central nervous system of fleas and other insects and pest. This inhibits them to function and causes to fire off the nerves. It cannot be found in plants and are manufactured in laboratories. Compared to pyrethrins, pyrethroids do not work quickly but have lasting effects compared to natural pyrethrins. This is usually used to control fleas by killing and repelling them. The most commonly used pyrethroids are allethrin, etofenprox, resmethrin, and permethrin. Resmethrin and allethrin are used to kill flying insects while the permethrin, etofenprox, and phenothrin are effective in controlling fleas and ticks. And since permethrin is long lasting in terms of killing fleas, it is usually found in products intended for long-term results. However, permethrin is oil-soluble, so this must be used in conjunction with products that use oil carrier to spread the pyrethroid to your dog’s body. Moreover, Permethrin should never be used on kittens and cats. In combination with undecylenic, these two ingredients are often used in pest control products. It is effective in killing not only fleas but also lice, ticks, and mites. It works by softening the waxy covering on insects and pests such as fleas which will eventually affect their internal organs, causing them death. Other active ingredients include lufenuron, fenoxycarb, pyriproxyfen, diflubenzuron, and methoprene. You can usually see these substances on flea and tick treatments. These products are known to inhibit the development of parasites and act as growth regulators. Be wary of the ingredients called organophosphate insecticides (OPs) and carbamates which can also be found in some flea products and best flea treatments. These chemicals are classified as carcinogenic to humans. Since fleas have existed for million years ago, controlling and getting rid of them has always been the challenge for pet owners. Whilst there are numerous products that were invented before, these products include chemicals which are harmful and poisonous to canines and other animals. The Good thing is, pet care professionals and pet product manufacturers nowadays have introduced safer products. 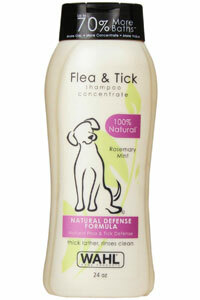 In the case of flea and tick shampoo for dogs, it has three types; natural, chemical and organic. Natural Flea Shampoo – this usually contains d-limonene or the citrus peel extracts which attacks the nervous system of insects and pests. Organic Flea Shampoo – is usually oil-based with some of the most common ones such as peppermint oil, cedar oil, clove oil, melaleuca, and neem. These oils are also beneficial for your dog’s skin. 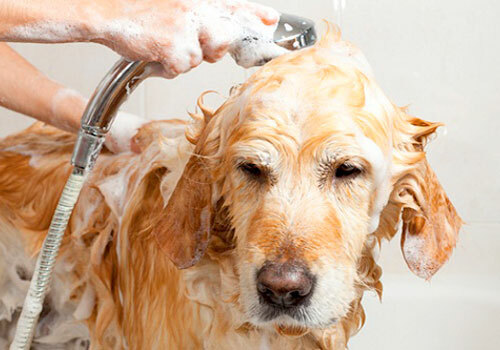 However, organic shampoos may not be as effective at killing fleas as it is more efficient to be used as a repellent. Chemical Flea Shampoo – refers to the pyrethrins and pyrethroids that are laboratory- made. As discussed above, it attacks and weakens the fleas’ nervous system that will eventually lead to death. 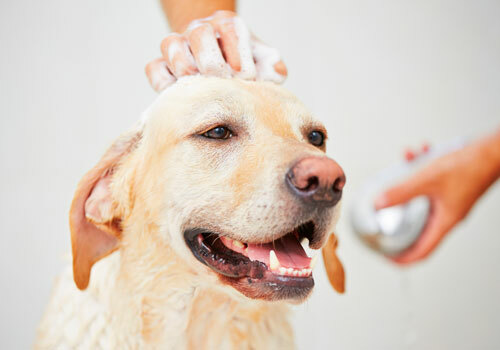 As responsible owners, it is a must to conduct our own research and have a deeper understanding of the different types of dog & puppy flea shampoos and its ingredients before actually using them. The ingredients can have different effects on humans, pests, and pets. Make sure to use products that are approved and safe for dogs. The product’s suitability may vary according to the animals and its age. Look at pets as individuals and try to use the least harmful treatment option. 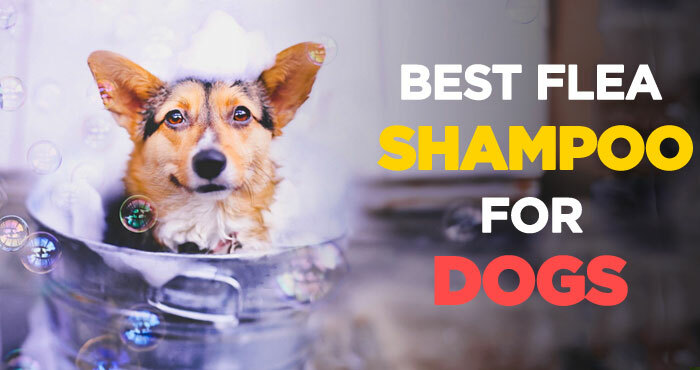 Although there are various dog flea shampoos on the market today that claims to be the effective flea solution, we come up with a short list of the best flea shampoo for puppies & dogs. Aside from killing adult fleas, Adams flea and tick shampoo is also efficient in getting rid or lice and ticks. Pet owners also love this as it can kill flea eggs and larvae which make it a development inhibitor and a growth regulator product all in one. 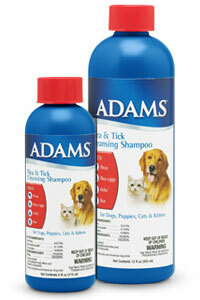 The Adams Plus Flea and Tick Shampoo is a concentrated lathering shampoo. It contains lanoline, coconut extract, soothing aloe and oatmeal which are all safe ingredients. And because it contains aloe and coconut extract, the shampoo will leave the dog’s coat shiny and manageable. It is also effective in softening and removing dandruff, scales, and dirt. Moreover, Adams flea shampoo can be used to treat puppies, adult dogs and kittens making the product more cost-effective. It provides 28 days of protection against fleas and ticks. Check reviews and latest price on Amazon. Sentry flea and tick shampoo is ideal for those who prefer natural shampoo for their dogs as it is made with natural ingredients such as extracts of various plants like aloe, papaya, neem, calendula, yarrow and citrus. It cleans deep down the coat and skin and helps relieve itching from fleas and other insects. 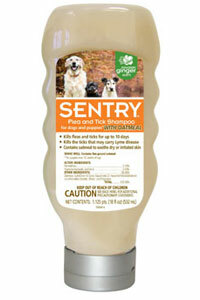 Sentry flea shampoo is safe to use for puppies over eight weeks and older. Your dog will sure to enjoy its rich lather, invigorating scent and lasting fragrance. Aside from killing fleas and ticks, Sentry Oatmeal Flea and Tick Shampoo can also help nourish and strengthen your dog’s coat and skin because of the infused botanical extracts. For best results, massage the shampoo into coat and make a rich lather. Leave it on for 5-7 minutes and rinse properly. Wahl flea and tick shampoo is another natural shampoo made with rosemary, cedar and mint oil. 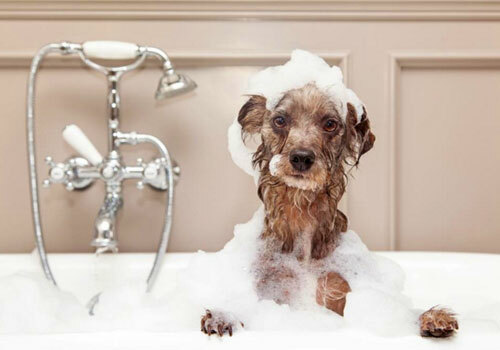 Like most of the natural shampoos, it will leave your dog’s skin and coat extra shiny and clean. This is ideal for dogs with sensitive skin or has skin allergies as it does not contain harmful ingredients. Moreover, Wahl 100% Natural Pet Flea and Tick Shampoo is only PEG-80 Free is an ethoxylated sorbitan monoester of Lauric Acid which is usually used in cosmetics. Wahl flea shampoo is formulated with 100% natural plant derived substances without toxic chemicals. These oils are efficient in repelling fleas and ticks up one week of use. 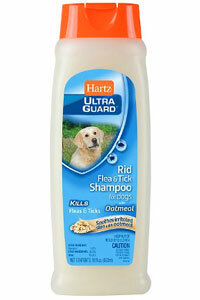 For immediate relief of itching caused by fleas and ticks, Hartz flea and tick shampoo is the ideal product to use. It is specially formulated to kill fleas and ticks including the deer tick which usually carries Lyme disease. However, Hartz UltraGuard Flea Shampoo is suitable to use for dogs that are 12 weeks and older. Aside from its ability to kill fleas and ticks, the shampoo will also clean, beautifies and deodorizes your dog’s skin and coat. Hartz flea shampoo provides 28 days of control and regulates the growth of pre-adult fleas and prohibits them from becoming biting adults. Just follow the instructions to achieve the effectiveness of the product. This is without any doubt one of the best flea shampoo for dogs with sensitive skin. Before you start treating your dog, follow these basic guidelines to ensure effectiveness and safety of the product you will use. Some of the products contain substances that are toxic to children, pets or adult humans. So while handling these products, it’s critical for your dog as well as your family’s health that you should follow these basic tips. Carefully read the label of your selected shampoo. Follow the instructions as there are specific amount and frequency of application of that particular product. Do not use products that are intended for dogs to cats and vice versa. Make sure that your dog can handle the ingredients of the flea shampoo since some pets are more sensitive than others. Always consider the age and health condition of your dog before using any flea product. Do not split the dosages, such as one dose for large dog in half and give it to two small dogs. Avoid using the product to elder, sick and pregnant dogs. Contact the vet if you have questions about the product and its possible effects. Wear protective gloves and aprons before applying the product. Flea and tick shampoo for dogs are among the most popular type of best flea treatment. However, it should be used in conjunction with other products and flea treatment options to achieve the most effective long-term results. Likewise, using puppy flea shampoos is relatively easy compared to using prescriptions and oral medications. It is crucial to read labels since some shampoos have specific instructions about proper dilutions and frequency of use. Make sure to follow proper usage and dosage as it can vary according to animal species and size. Start your bath routine with a tub with warm to cool power. Wet and lather around the neck area to prevent fleas from escaping to the head area and from hiding in your dog’s ears and near the eyes. These areas are more difficult to shampoo. Move on to the dog’s body and wet the coat and lather it well. Let the shampoo sit for a few minutes then rinse it thoroughly. Remaining products on the skins and coat may dry and cause dandruff so rinse it well. As long as your dog does not have any skin condition that will inhibit you from doing so, you can use dog flea shampoo with conditioner. Keep in mind that although these shampoos are efficient in removing fleas and controlling them, your dog’s environment is where it gets those parasites. The most effective and long-term control you can do is to use products that will get rid of fleas where they live. Invest in foggers or environment sprays to treat the areas. Outdoors and indoors can be both infected by fleas. Daily cleaning and vacuuming must be part of your flea control program. Fleas can thrive in your home, regardless of the season, but they are worse during spring and summer. Treat your dog upon seeing the first sign of flea infestation. Not only you should treat your dog but also you should begin treating your home too. Check with the vet first before introducing any product or treatment options to your dog. This is crucial for dogs under medication, elder, pregnant or nursing or dogs that are allergic to certain chemicals and products. 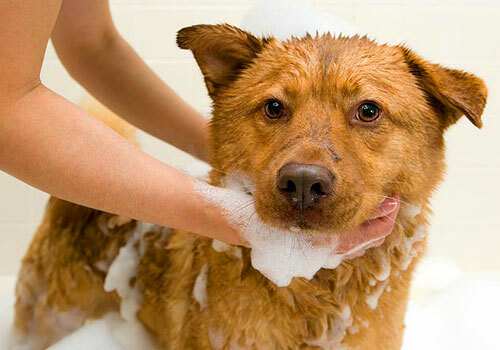 Only apply the proper amount of shampoo according to your dog’s size. Never mixed-up products and use dog products to cats. Wash your hands with soap and water after applying the treatment or wear gloves when doing so. Also, follow proper disposal of packaging. Avoid keeping the pets in a single area while waiting for the product to dry. This will prevent them from licking and drying each other and swallowing the chemical. If it is the first time for Fido to use the product, monitor if there are any signs of reactions such as vomiting, diarrhea, poor appetite, excessive drooling or depression. If any of these symptoms are present, call the vet immediately. Likewise, bathe him immediately with soap and water if he has bad reactions towards the flea shampoo for puppies. 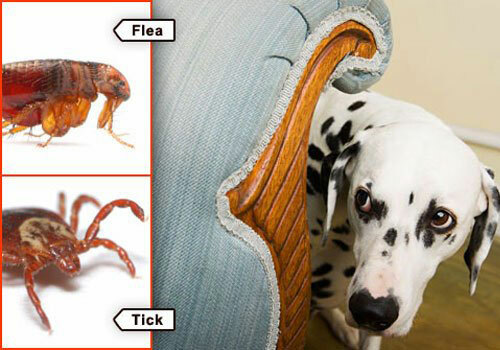 Again, aside from treating your dog, you should also control pests in and out of your house. Ask the vet for the suitable pesticide to use if you opt for sprays to kill pests and insects. Flea and tick shampoos are crucial tools in fighting these tenacious parasites. Every pet owner should explore and be aware not only about the good flea shampoo brands, but also the benefits and ingredients that these products contain. You can read more information on the manufacturer’s website and consumer reviews online. Moreover, your patience, time and efforts as a pet parent are the best qualities that will help you treat and prevent the irritating pests. And because not all shampoos are alike, you have to realize that your dog may or may not be fond of a specific flea shampoo brand. That makes your job even harder to find the best flea shampoo for dogs. These pests may never become extinct, but you can do something to prevent it from infesting your furry friends at home. Also, did you check our guide for the best bark collars? If your dog is barking excessively, then be sure to check it. You’ll thank me later. Adams Flea and Tick Shampoo was reviewed by Brian Hersh on September 25, 2018 . *Disclaimer: Our best flea shampoo for dogs reviews are based mostly on our expertise and the experts/veterinarians we consulted with and the information provided by the manufacturers. We do test many products, but it’s not possible to test them all. As such, please remember the above recommendations are our opinions, and before using any treatment, please consult with a local veterinarian.